Like many of us, Chesapeake Bay Magazine’s Virginia fishing correspondent Kendall Osborne has been facing skin issues after so many scorching days on the water. Since being diagnosed and treated for basal cell carcinoma, he has increased his coverage, his skin protection and his relationship with his dermatologist, who reads him the riot act. On his last visit, the doctor insisted that he apply sunscreen before leaving the house every day, and she recommended Klenskin, a new shower-on product. We immediately ordered two kits to try and compare. Osborne and I used the product regularly on fishing and walk-around days for three months. Meanwhile, CBM art director, Jill Allen, tried the stuff out on her sun-loving family at the beach for a week. Klenskin is meant to be lathered on in the shower, just before you get out. My first question was, “Who takes a shower before going fishing?” The Klenskin answer is—people with potential skin issues, which includes everyone in this time of depleted ozone. But, why a shower? The honest answer is, applying sunscreen on the way to the boat guarantees that I’ll miss some acreage. 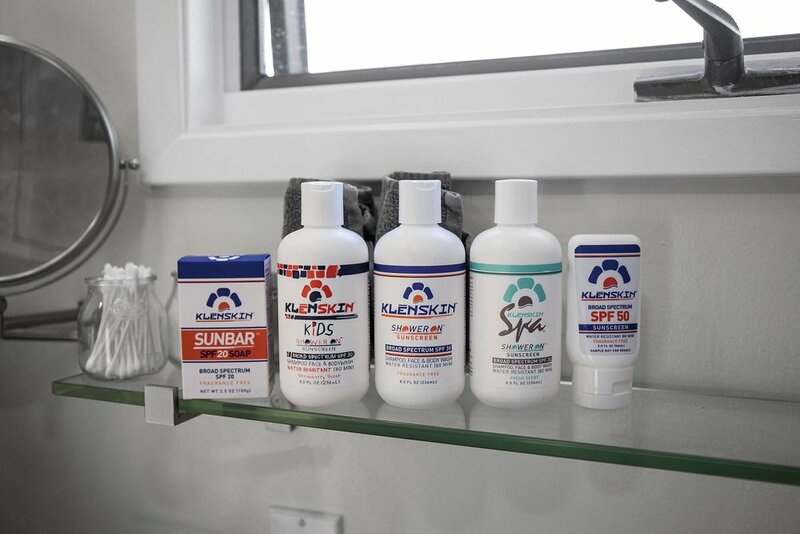 With the Klenskin SPF-20 sunscreen shower bar, I habitually cover the key places, behind my ears, the back of my neck, the tops of my hands, my bald head, the back of my knees, my ankles and feet and everywhere else, including places where the sun don’t usually shine—And it works. I can feel it pleasantly on my skin throughout the day, and it seems to hold up to sweat and spray better than the standard stuff. Plus, I’m now the best-smelling angler on the boat, which isn’t saying much. Jill reports that she expected to find residue on the shower floor like you find with in-shower lotions, but this didn’t happen. She used the SPF 30 shampoo/face & bodywash lotion on her two small kids before sending them onto the sand. She was careful to “pat dry,” as instructed in micro-print on the label. She reapplied as directed, and it did the job. This attention to detail is what makes moms so great. “I think it’s an ideal product for people who are in the sun all day, where applying sunscreen needs to be part of their daily routine,” she says. And, it’s easier to apply to energetic kids who may not cooperate in the last minute before attacking the beach or the pool. Kendall takes his fishing, sunscreen, hats and long sleeves seriously, as we all should. He doesn’t much like the feel, the pasty looks, and the stinging eyes of conventional sunscreen products. With Klenskin, “I lather up for at least 30 seconds, as directed, rinse and dry,” he says. “It works well. No sunburn. It’s not greasy, and it doesn’t turn my face white.” He also reports that it stings his eyes a bit, as all sunscreens do. Klenskin is available as a shower bar, an SPF 30 strawberry-scented face and bodywash for kids, a fragrance-free SPF 30 lathering lotion, an SPF 50 reapplication lotion, and an SPF 30 spa-fresh shampoo, face and bodywash. The company also packages the lotions in single-use tear packs for travel—available at select dermatology centers and online at www.klenskin.com.